Jeff Belletto of Modesto, his father Harry Belletto, of Modesto, Tracy Bolin of Valley Springs, and Cary Treadway of Stockton, were all feature winners in the NASCAR sanctioned racing action this week at Stockton 99 Speedway as the clock winds down and the point battles tighten for the season championship honors at the 55-year-old quarter-mile "Action Track." The C.L. Bryant/Union 76 Gas Late Models were on hand with their twin-38 lap features that saw Dave Byrd of San Jose on the pole for the first contest. After a quick first lap yellow for a spin by rookie runner Jeff Moore of Fairfield, it was Byrd who took the point with Jeff Belletto hot on his bumper. Eric Schmidt of Roseville came to second on lap-eight with the only other yellow on the event falling one circuit later as Chris Wadsworth of Oakley and Harry Belletto of Modesto got tangled up in turn-four. 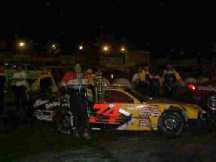 Belletto got two wheels onto Wadsworth’s car and cut a power steering line spreading oil on the track surface and sending the veteran Belletto to the inner pits and out of competition for the first main, while son Jeff grabbed second back from Schmidt at the flagstand. On the restart, heat winner Jeff Belletto took the point with his brother, and incoming point leader, Steve Belletto of Modesto coming to third one go-round later. With Jeff in the lead, the battle waged between Steve and Dave Byrd of San Jose for second, with Steve leading Byrd by two foot on lap-16 to make it a solid second on the next pass. 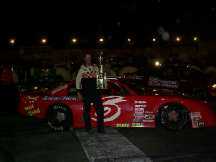 The event ran without trouble to the checkered as Jeff scored his third career feature win over Brother Steve. Eric Schmidt held on for third ahead of Wadsworth, and fast timer Joey Zampa of Napa. Sam Solari of Salida won the other heat, with the dash victory falling to Byrd. In the second 38-lap feature it was Steve Belletto with the early lead by a bumper from the outside pole over Wadsworth. A fast moving Zampa came to second on lap-five with the first yellow falling on the next pass as rookie driver Justin Whalen of Gilroy looped his racer in turn-two. Two laps later the lead passed to Zampa with a spin by Brian Griffitts of Stockton slowing the show on lap-nine. Another yellow followed when Solari and John Graham of Stockton spun in turns one and two and Jeff Belletto looped his racer in turn-four. The restart produced the worst crash of the night as Justin Whalen spun coming off turn-four to be pinned by Graham, Jeff Belletto, and Solari, with Solari and Graham out of action for the remaining laps. Steve Belletto led on the restart by a nose but Zampa charged back to lead the following circuit with Wadsworth coming to second on lap-13. Two more yellows for spins by the rookie driver Whalen earned him a black flag and time to think about a Skip Barber Driving School lesion or a Joey Chitwood career. Eric Schmidt got his nose past Zampa for the lead on lap-26 with Zampa coming back on the next pass as a final yellow fell for a spin by Lathrop pilot Angelo Queirolo that allowed Harry Belletto to gain second at the line. Harry took one pass to settle his car and then roared past Zampa to take final charge on lap-30 with a smooth blast to the checkered. Zampa held on for second over Schmidt, Steve Belletto, and Wadsworth. Steve Belletto increased his point lead to 32-marks over his brother Jeff who moved into second over Byrd in the season chase. Schmidt, Queirolo, Griffitts and Kevin Pugh of Sacramento also became the final drivers now pre-qualified for the final leg of the three-race California Hotwood Tri-Holiday series set for September first. The Pro Stock action saw rookie runner Tracy Bolin of Valley Springs with the first lap lead from his pole position start. Grand American point leader Robert Knittel, on a ‘busman holiday’ and running a Pro Stock on the night, came to third on lap-five and second on lap-11, with incoming point leader Cary Treadway of Stockton on his bumper. The only yellow fell on lap-14 as Joe Hylton of Manteca and Chris Monez of Lodi both spun in turn one & two. The restart allowed Knittel to blast into the lead with Treadway coming to second as the two moved away into their own personal battle for the victory. Knittel held tough to claim the win over Treadway who had set fast time and won his heat and dash events. Mike Monez of Lodi ran third ahead of Hylton, and heat winner Bolin. A bad crash in the first heat saw incoming second place point runner Jeff Lovelace of Stockton transported to an area hospital for chest pains, and his missed feature entry caused him to slip to third in points with Hylton rising to second behind the leader Treadway. The rough & tumble Pure Stock division saw a first lap feature lead by Steven Hall of Manteca in a 25-lap melee that produced eight yellow flags. 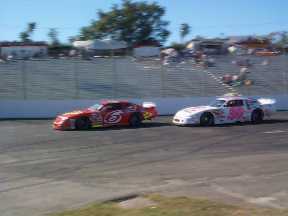 Bryan Clark of Lodi took charge on lap-seven, passing the point off to Tom Bolin of Morgan Hill on lap-10. Bolin recorded the win over heat winner Chad Holman of Stockton, and Ray Davis of Galt. Clark finished in fourth ahead of incoming point leader Danny Guibor of Manteca. Additional heats were won by John Median of Galt, Cindy Freitas of Lodi, and Tom Dahl of Stockton, with the dash event win going to Medina. Eric Graef of Galt won the B-Main competition that features Ray Bird of Stockton as the current point leader. Racing action will continue next Saturday August 18th with a 200-lap, $2,000 to win Ultra Wheel ‘Summer Sizzler’ Pacific Coast Late Model Track championship event that may proved to be the stellar event of the year.